NAGPUR: Even as Maha Metro Nagpur gears up for launch of its services, Safety Run was conducted on a stretch of 2 km, today (13thFebruary) between Airport and Jai Prakash Nagar Metro Stations. The Safety Run was conducted with the help of Buland Shunter Engine. Maha Metro MD Dr Brijesh Dixit personally conducted the Safety Run. The Safety Run was conducted to test multiple features associated with the project like Track, Over Head Electrification (OHE), Stations and other associated essential components, said Dr Dixit while speaking to media at Airport Metro Station. 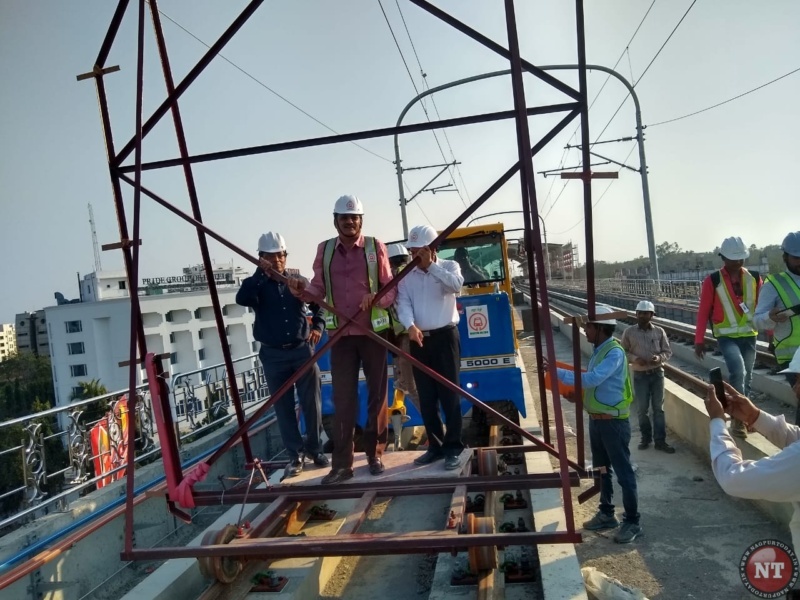 The Research Design and Standards Organisation (RDSO) team would now visit Nagpur Metro Project for inspection on February 15, instead of February 14, as announced earlier, he said. The RDSO Inspection would be held using the coaches recently delivered to Maha Metro from CRRC, Dalian, China. The train would run between Khapri and Congress Nagar Metro Stations, he added. The gravity of the work undertaken by Maha Metro Nagpur can be gauged from the fact that about 12,000 workers are engaged in completion of the project across city. Of these, as many as 400 are employed at Sitabuldi Interchange only. Major work at Airport Metro Station and other outstanding tasks at other locations have been completed and only the finishing work is to be taken care of, he further said. The remaining work at Airport Station would be over in the next 3-4 days, he said. The Metro services would be operational very soon, the MD assured. Speaking about the ongoing work at Variety Square – which is part of Reach-II, he said, two girders have to be installed till now. The two ends across Gowari Flyover are being joined to establish connectivity on the stretch between Sitabuldi Interchange and Automative Square, Dr Dixit said.